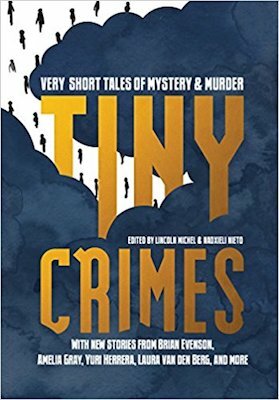 The following short story by Richie Narvaez, “Withhold the Dawn,” is an exclusive excerpt from the new flash fiction anthology Tiny Crimes, edited by Lincoln Michel and Nadxieli Nieto. In “Withhold the Dawn,” a woman buys an ax on sale and takes her revenge against the IRS. Gladys Gutierrez hated the IRS. In her mind, the IRS had destroyed her parents, crossing them out of her existence like disallowed itemized deductions. It didn’t matter to her that Mami and Papi had neglected to pay taxes for a dozen years apiece, Gladys still wanted revenge. From dawn to dusk and even in her dreams. To that end, she purchased—on sale!—a thirty-two-inch Summerfield Tru-Cut™ axe, drop-forged of carbon steel with an American hickory handle. She never dated, never married, never held an honest job. Revenge was her only companion. Each year she moved to a new town, created a new identity, sent in new tax returns. She bungled the numbers on purpose, giving herself exceedingly generous refunds. Most times, she got the money. This disappointed her. While she enjoyed the cash, the reward she craved was that neat letter in a neat envelope from the IRS. There would be an audit. An agent would be coming by. In Wyoming, for example, Gladys claimed she worked as a safari guide. Two months later, an IRS agent named Steven W. Cabeza-Plana rang her doorbell. Cabeza-Plana’s hair was stuccoed in place. His teeth were bathroom tiles. Gladys disliked him immediately and offered him iced tea. Numb and paralyzed but still awake, Cabeza-Plana listened as she hacked off his right arm, then his left. Then, as was her habit, she made agent meat loaf, empanadas, and guisada. She ate like a one-percenter for days. But, over time, Gladys found she had less luck. Year after year, refund after refund arrived without question. She became rich. But she ached with an awful. hankering. And her Summerfield rusted with ennui. So when she moved to Klamath Falls, she sent out ten different forms using twelve different names. Sure enough, neat little letters started arriving in the mail. Four agents came by in one week, all carrying neat briefcases and flicking pens. The first one did not drink enough tea, so when Gladys emerged with her Summerfield, a scuffle seemed about to ensue. But the agent had spilled the tea on the floor and, approaching Gladys in his wingtips, had slipped, tripping and sending his forehead right into the edge of her axe. With the second and third agents, everything went hunky-dory. Tea. “Pie.” Chop. In fact, by the time the fourth agent arrived, Gladys found herself bored. She brought the axe to the door and took him out just as he stepped in. That month, Gladys made so much meat loaf, empanadas, and guisada that she began selling the extra. Everyone on the block said they were delish. She was even written up in a neighbor’s blog, something that delighted her because who wouldn’t want to be on a blog? It also made her wonder if perhaps the ardor of her revenge had been quelled. Yes, perhaps it was time to put away her faithful Summerfield and have a real life, to sleep next to something warm and soft, not cold and sharp. And then one day, in hazy August, the doorbell rang. Slouching and unzippered, Haragán did not seem at all like an IRS agent to Gladys. Haragán handed her a dirty envelope. Gladys didn’t understand. She had already received her refund under the name Feldshuh. Twice. Gladys took the filthy envelope. The letter inside was wrinkled and a coffee stain made a crude yet artistic design in one corner. “What’s the hullabaloo?” she said. “Would you like some iced tea?” she said. Gladys found that she was irresistibly attracted to this fellow. But he was IRS. Gladys found that she was irresistibly attracted to this fellow. But he was IRS. And she hated the IRS. She could sneak up behind him with her cherished Summerfield—so she wouldn’t have to see his pallid, scrambled-egg-speckled face. It would only take one good swing to get through that skinny, razor-burnlined neck. Instead she began to cry. “Mrs. Feldshuh, there, there.” Haragán held her. She would have stopped crying but the smoke from the cigarette hanging in his mouth made her eyes water. And she didn’t want him to stop holding her. So she kept crying. And coughing a little. They made love half-on and half-off the kitchen island right then and there. The next morning Haragán returned, freshly showered and shaved, and smelling lightly of coffee and its aftereffects. He brought three Federal agents and a bouquet of freesia. 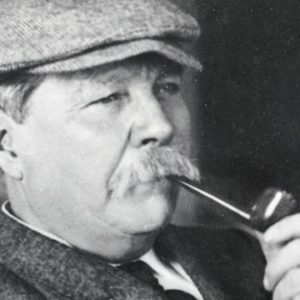 The Summerfield axe sang to Gladys from the bedroom, called for her to wield it as the deadly instrument of justice it had been purchased—on sale!—to be. She ran toward it. But all three of the agents tased her. “My boss is so proud of me for this. I hope you know how grateful I am. Oh, and thanks for lunch yesterday,” Haragán said, winking. Although the families of the IRS agents Gladys had killed and cooked with oregano, sofrito, and a teaspoon of cumin almost all forgave her on a highly rated episode of Good Morning America, she spent the rest of her life in a penitentiary, sullen and unpardoned. As for her precious Summerfield—after spending years in a lockup, it was auctioned off, then passed from owner to owner, from year to year, and all the while, from dawn to dusk and even in its dreams, it hummed a Don McLean tune and dreamed of revenge.